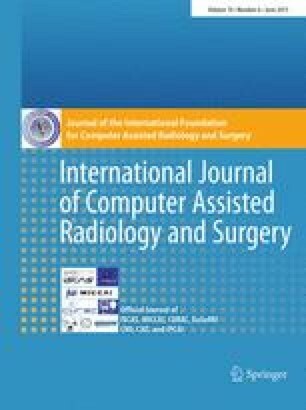 The transfer of preoperative CT data into the tracking system coordinates within an operating room is of high interest for computer-aided orthopedic surgery. In this work, we introduce a solution for intra-operative ultrasound–CT registration of bones. We have developed methods for fully automatic real-time bone detection in ultrasound images and global automatic registration to CT. The bone detection algorithm uses a novel bone-specific feature descriptor and was thoroughly evaluated on both in-vivo and ex-vivo data. A global optimization strategy aligns the bone surface, followed by a soft tissue aware intensity-based registration to provide higher local registration accuracy. We evaluated the system on femur, tibia and fibula anatomy in a cadaver study with human legs, where magnetically tracked bone markers were implanted to yield ground truth information. An overall median system error of \(3.7\) mm was achieved on 11 datasets. Global and fully automatic registration of bones aquired with ultrasound to CT is feasible, with bone detection and tracking operating in real time for immediate feedback to the surgeon.